Most Practitioners and Practitioners-in Training will have learnt how to look at the overall posture, areas of tension, gait irregularities or changes in the texture or appearance of the coat etc in dogs and horses but some may not have had the opportunity to apply these same observational skills to cats. Posture is very important to cats; the way in which they present themselves can determine how other felines relate to them as well as how they feel and respond. Cats like humans, dogs and horse use their bodies to help relieve physical, emotional and mental stress and any inability to do so may cause psychological problems and distress. A cat that has tension patterns within its body will have a reduced ability to communicate and may lose confidence as a result. The information you can gain by observing your cat on a daily basis encourages you to question why she acts in a certain way, rather than blithely assuming that it's just a quirk of character. It enables you to pick up on health problems earlier rather than later, and in the case of problem behaviours can help you to identify underlying causes and change them with TTouch work. It can also tell you not just how she's feeling physically, but whether she's actually enjoying (or merely tolerating) interaction between the two of you and enables you to watch for early warning signs that she might be about to react defensively. By pointing out the postural tendencies of a cat to your client or shelter worker you will help them to gain a clearer understanding of why TTouch work is of benefit and will enable them to note when changes occur. Injury - as with humans, the presence of pain can affect posture, movement, and reduce tolerance levels. Even after an injury has healed, the body may maintain the previous posture, which then continues to affect behaviour. Trauma - shock as a result of an accident or emotional upheaval can cause tension within the body. Cats are often very sensitive to changes; not just major ones such as moving house or bereavement, but minor ones too, such as simply rearranging the furniture. Born that way - some cats show tension patterns from birth, rather than as a result of other factors. The more you watch your cat, the more your powers of observation will develop, and the more you'll begin to notice even small but significant areas of tension in your cat. First study the way in which she moves – is she co-ordinated, balanced and supple or is she stiff? Is she relaxed and calm or is she anxious? Does she blink or are her eyes wide, hard and staring? Next, look more closely and in more detail. Does she have a slight head tilt? Does she carry her tail to one side? Does one ear appear higher set than the other? Does her back and tail move fluidly or is any part of her spine or tail bone rigid and straight? Does she spasm through the skin when sitting? Can she jump on or off furniture or the windowsill easily or does she struggle to jump up or land awkwardly or heavily? Is any part of her coat standing up? Does she have dandruff over her back? Hot/warm/cool/cold areas; differences in temperature through the body can be easier to feel if you use the back of your hand rather than the palm. Changes in coat texture such as areas where the coat is rough. Feelings of tightness in the skin or underlying muscle tissue. Uneven muscle development – particularly over the hind quarters. Whether your cat expresses concern when you touch certain places on her body; for example moving away from you, growling, or if the skin appears to spasm and ripple beneath your touch. If your cat is reactive about being touched and likely to strike out with claws or teeth, use a long handled artists' paintbrush or goose/swan feather so you can keep your hand at a safe distance and minimise her concern about being handled. What can be done?Although it's often possible to effect a very rapid improvement with TTouch, it's important to be realistic about how much you can achieve within a certain period of time. Generally, the longer an area of tension has existed, the longer it will take to restore the balance, as the cat will have become habituated in her pattern of behaviour and movement. Little and often is the key and cats are excellent at teaching you that a little bit of TTouch work goes a very long way. If your cat continues to show extreme concern about being handled your first port of call should be your vet to determine if there are physical problems. Cats are more prone to injury than we think and many are likely to have had an accident that has gone unnoticed as cats spend a large part of their time out and about without us. X-rays and health checks that I requested for shelter cats that were extremely reactive to contact and considered un-homeable, revealed fractures of the spine, tumours or advanced renal failure. In some of these cases the cats with old spinal injuries did go on to be successfully rehomed as the staff could then explain to prospective adopters that the cats were not being aggressive without good cause. They were also able to show them how to use TTouch to help keep the cats comfortable. Mouth: a lot of emotion is carried in the mouth, so it can provide you with a lot of information as to how your cat is feeling. If tight in the mouth, the ability to use the tongue - used for grooming as well as a sensory organ - may be inhibited. Those with very tight mouths are often picky eaters, are more inclined to be vocal, and are often more likely to bite. When stressed, the whiskers will shoot forward and bristle, but some cats have so much tension in the muzzle that the whiskers may be constantly held in this position. When looking for tension in the mouth however, look for other factors such as the ear and tail set. Cats that are happy and relaxed will rub their whiskers against furniture or their owners legs. Stroking the whiskers backwards with a soft brush will mimic this calming response and is a safe and highly effective way of helping a stressed cat relax. This is particularly useful when working with a cat that is unable to eat due to high levels or anxiety and is an excellent precursor to Mouth Work. Some cats naturally carry their whiskers more forward than others so you cannot rely on the set of the whiskers alone to determine whether the cat is concerned. The eyes are the window to a cat’s soul. If the eyes are hooded like those of an owl, it can be a sign of stress and trigger reactive behaviour, whilst staring eyes can be a sign of discomfort and/or escalating levels of stress. 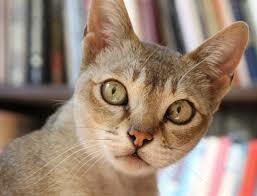 Very wide pupils can indicate a high degree of concern and that the cat is feeling threatened. Check the iris as well; felines that have suffered a lot of trauma, stress or have underlying health problems may have very blotchy or discoloured irises. Using feathers or soft paint brushes around the eye and over the head triggers blinking which helps the cat to relax and to feel more relaxed. Very anxious cats are often extremely tight in this area, which is often linked to the appearance of wide, staring eyes and tension around the base of the ears. If there's a lot of tension over the top of the head it may even feel hot to the touch, and the cat may be very reactive to contact over or near the head. As with most animals, cats use their extremities to impart information; fast twitching ears although usually a sign of arousal or interest can also be a sign of nervousness. Flattened ears can be a sign of increasing stress levels and are often accompanied by a flattened back. Very taut, alert, pricked ears might indicate that your cat is interested in something, but can also be due to over excitement and arousal. Lack of ear movement may indicate deafness. Many cats will appear to be enjoying contact then attack without warning. This is referred to as ‘relaxation induced aggression’ and although it can happen without warning ear movement may be non-existent prior to the attack. For cats that exhibit this type of behaviour keep the TTouch sessions short and use a variety of different Ttouches or tools. Cold ear tips (provided the cat is not actually cold or unwell) often accompany cold feet and can be a sign or timidity. Unlevel ears can be a sign of tension in the neck and/or jaw. As there are many acupressure points in the ear cats that dislike having their ears or parts of their ear touched may be suffering from ill health or tension or discomfort in other parts of their body. Stiffness felt in the neck is often linked to a short, choppy stride when moving, and tension may be also present in the back. It can give rise to issues with having vaccinations or being micro chipped. Cats that are tight in the neck and the jaw may also be difficult to pill as strain is often inadvertently placed on the neck when the cat is being medicated. Tight shoulders are often linked to tension in the neck, and can create stiff-legged movement. This posture is likely to unintentionally trigger reactive behaviour from other cats as it looks like a stalking/preying/pouncing stance. Arching of the back, with a gentle flick of the end of the tail when being stroked are usually good indicators of a happy feline, along with a sleek, well cared for coat. 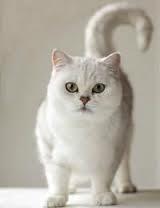 A cat that is stiff won't be able to groom properly and the coat may be rough and unkempt. Very reactive behaviour when touched, the presence of dandruff and scurfiness may all be signs of tension in the back. Rippling of the skin and fur, particularly if accompanied by a swishing tail.or raised patches of hair can also be indicators of a tight back. When distressed, a cat will tend to puff up the fur along it's back and tail; tightness within the skin and underlying muscles can, however, also cause the hair in that area to stand up giving the appearance that she is adopting a defensive/threatening posture. This can send the wrong messages to other cats and as with dogs may be linked to a permanent feeling of stress or arousal in the cat. When a cat sits, the spine should generally follow a gentle curve, rather than being excessively straight in part or parts of the back. Cats that are notoriously difficult to pick up and handle often have immobile areas of spine. Since cats tend to get picked up a lot, discomfort in the spine or back can cause them to become increasingly defensive in their behaviour towards people. Cats that dislike their flanks or bellies being touched may have tension in the back but may also suffer from digestive problems or discomfort in the abdomen. As anxiety affects the stomach and is linked to a tight forehead, nervous or stressed cats are unlikely to enjoy contact on or around their bellies. A timid or worried cat will crouch down through her hindquarters and back legs, shrinking the whole body to try to make them self appear less conspicuous. A relaxed happy cat will often roll onto her side or back, but if pain or tension is present in the back or hind quarters she may be reluctant to do this, losing the ability to de-stress herself in this way. Tension around the hind quarters often also goes hand in hand with noise sensitivity and timidity. As an extension of the back, the tail can be a mirror of what is happening through the rest of the spine - if a part of it feels stiff or your cat dislikes an area being touched, check again for signs of tension you may have missed noticing in the corresponding area of the back. A tail which kinks off to one side may indicate the hip is dropped on that side. Cats will use their tails a lot to express themselves, so also watch out for a fast waving tail (increasing stress), constant twitching (tension through the back), gentle twitching at the tip (happy), held high (welcoming), and lashing (get out of the way quick!). Look at the shape of the pads, the spread of the toes and the wear on the claws. Scuffed claws are a sign that the cat may have been hit by a car or fallen from a tree. Unevenly shaped pads, or toes that more spread than the others are indicative of uneven balance through the limbs as the pads will flatten more where there is more weight. Though this is often more obvious in dogs than in cats, injuries or long term stiffness can alter the way in which a cat moves placing greater strain on part of the foot or on one or more of the cats limbs. Look at the shape of the pads, the spread of the toes and the wear on the claws. Scuffed claws are a sign that the cat may have been hit by a car or fallen from a tree. Unevenly shaped pads, or toes that more spread than the others are indicative of uneven balance through the limbs as the pads will flatten more where there is more weight. Though this is often more obvious in dogs than in cats, injuries or long term stiffness can alter the way in which a cat moves placing greater strain on part of the foot or on one or more of the cats limbs. Cold feet often accompany timidity or flightiness and sweaty pads can be a sign of stress. Cats that dislike having their paws touched may be nervous, as are those which tend to claw. A cat that is calm will usually slowly extend and relax her claws. Excessive kneading when handled can be indicative of a nervous cat. Not all cats purr, and those that do aren't always expressing contentment. Cats that don't are often very tight through the whole body, and may carry a significant amount of tension around their mouths. They may never fully relax. Cats can also purr when very stressed, even when dying. 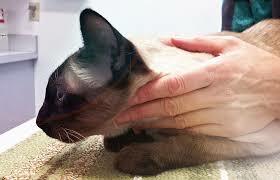 Don't always assume that just because a cat is purring when being handled that it's a sign she's enjoying the contact. As with all tension patterns and behaviours view purring and any other vocalisation or behaviour in context with the rest of cat’s posture.